The Longhorn Cowfish is a tropical fish that is recognizable for its two long horns located on the front of its head, similar to a bull or a cow. It’s usually found swimming along the coral reefs in the tropical and subtropical regions, at a depth of about 1 to 45 meters. Although it’s not entirely suitable for home aquariums, its popularity has been booming these last few years. There are many different species of cowfish but this particular one is the most popular, mainly due to its unique looks and adorable personality. If you’re thinking of taking care of this amazing undersea creature, here are 7 little known longhorn cowfish facts that you should know first! One of the reasons why this fish isn’t so suitable for most home aquariums is because of its ability to produce an extremely potent ichthyocide, a kind of poison that can kill fish species. This poison, called ostracitoxin or pahutoxin, is a non-protein poison unique to the cowfish family. Located in their skin’s mucous secretions, the ostracitoxin is excreted whenever a cowfish is stressed. Ostracitoxin is so powerful, it can kill anything nearby with rapid ferocity, including the cowfish itself. It also resembles red tide poisoning and sea cucumber poisoning. The only good thing about its poison is that it doesn’t seem fatal or even that harmful to humans. This means that even if you manage to come into contact with poisoned water from the cowfish, there’s a really good chance that no harm will come your way. Unfortunately though, this doesn’t quite apply to other fishes in your aquarium. 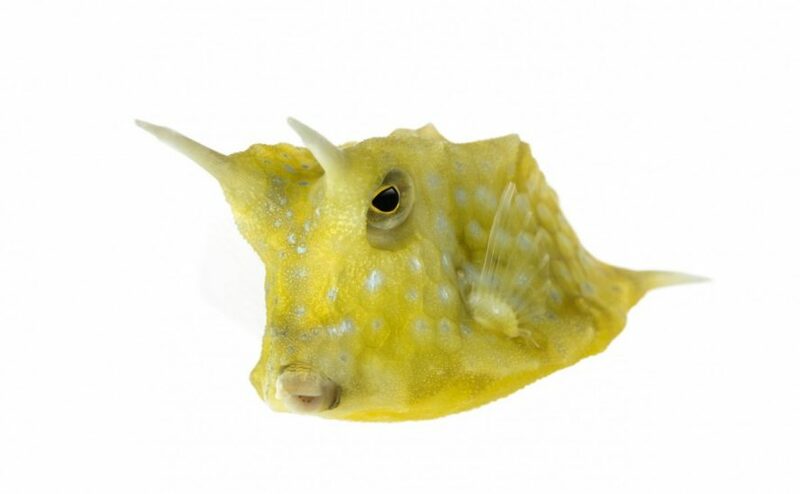 Keep this in mind in case you really want to add a longhorn cowfish to your tank! The longhorn cowfish has an inferior or ‘subterminal’ mouth, which means that its mouth is located on the underside of its head. A subterminal mouth on a fish often suggests that the said fish is a bottom feeder or food scraper. Those with subterminal mouths often eat invertebrates, algale, and any leftover food that falls to the bottom of the sea. This is no different from the longhorn cowfish, who tend to eat algae, worms, and mollusks, among other vegetable-based and meat-based foods. In aquariums, they tend to wait for the food at the bottom rather than race to the top to get it. That’s why, if you’re taking care of a longhorn cowfish, you have to put proper measures to make sure that it’s eating well. This includes not putting it inside a tank with other fish that are too fast, as the cowfish won’t be able to compete with their speed. This could cause your cowfish to starve and eventually die. We ensure our Longhorn cowfish gets to eat enough veggie matter by adding Seaweed strips to clip holder and feeding them with this essential food twice a week. We use Omega One Veggie Seaweed Strips and use a saltwater Seaweed food clip to hold them in place like the one pictured. Have you ever seen the eyes of a longhorn cowfish? If you haven’t yet, you’ll be amazed to find out that looking into the eyes of this cowfish is like looking out at the stars above. This is due to a phenomenon called corneal iridescence, which is caused when the eyes are covered by a special layer of tissues to block direct sunlight from above. These eyes are quite reflective and show off beautiful colors when seen under direct lighting. In many fishes, this phenomenon can be seen even hours after the fish has died. Interested in seeing eyes like these? You can see them on the longhorn cowfish! When you first see a longhorn cowfish, one of the first things that you’re probably going to notice about it – aside from its splendid horns – is its unique way of swimming. Unlike most regular fish, the longhorn cowfish makes use of a swimming method known as ostraciform swimming. From an outsider’s perspective, this kind of swimming can look like the cowfish is hovering in the water, similar to a spaceship or a UFO. Ostraciform swimming describes the method of swimming where the fish’s body is held rigid and the dorsal and the caudal fin (that is, its tail fin), merely oscillate or move in a pendulum fashion. This causes ostraciform-swimming fish to move slower than normal, since rapid swimming can only be caused by a rapid tail movement. This method of swimming occurs in fishes like the cowfish and boxfish whose head and body are locked within a rigid bone structure that doesn’t allow much movement, unlike with other fish. Did you know that a longhorn cowfish’s horns can actually break? Ouch! But while breakages may seem uber painful or unhealthy for the longhorn cowfish, it’s actually not. The horns of these fish actually break rather often due to a variety of reasons, mostly due to the cowfish hitting his head on something. Longhorn cowfish are actually very shy creatures, and they tend to hide somewhere if they feel really shy. Sometimes, they could break their horns if they’re trying to hide from something, especially if the space is much too small for them. They’re also quite curious, often poking their heads here and there trying to see what’s up. This can also cause the cowfish’s horns to break. Just imagine a cowfish poking his little head in rocky formations – there’s your breakage. There’s absolutely nothing to worry about if the horns break off as it’s simply the way they were programmed by Mother Nature. Cowfish won’t die from broken horns alone. If they do break their horns though, the horns would start growing back in a few days and they would be fully grown again in just a few months. 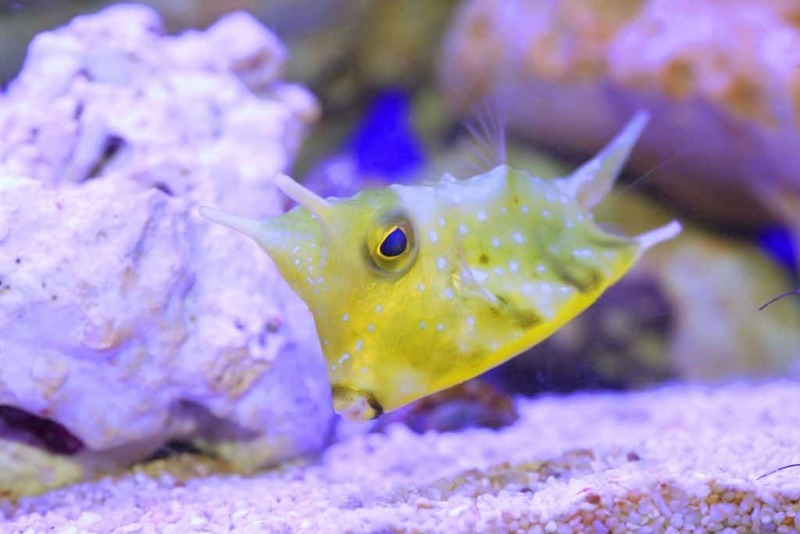 If you have a longhorn cowfish in your aquarium and would like to avoid having your cowfish’s horns breaking off, always make sure that there’s ample space for him. It doesn’t matter if it’s just for general swimming or hiding. Make sure that there’s enough space just so that your cowfish won’t accidentally break his horns somewhere. Learn how long Longhorn Cowfish can live and how to improve their life expectancy. It’s rare for fish to make any sort of sound, but the longhorn cowfish can do exactly this. And it’s not just any regular sound, either. 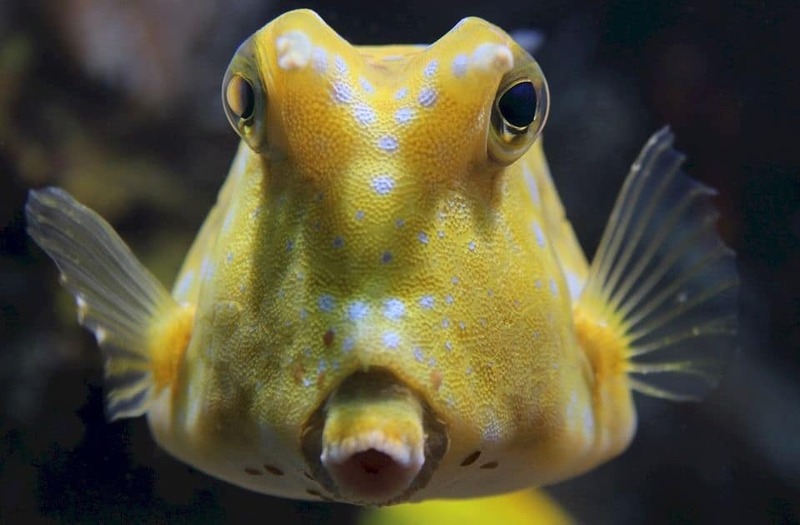 A longhorn cowfish can actually make a human-like sound that’s very similar to a grunt. The thing is, there’s no complete list of reasons as to why the longhorn cowfish makes this sound and many are still baffled by it. After all, it’s certainly fascinating how a fish could make a sound that only humans are supposed to be able to make. One of the reasons, however, is whenever somebody manages to catch it. Since the cowfish moves extremely slowly thanks to ostraciform swimming, it’s also very easy to catch. If it does get caught, it makes a pretty cool grunting sound that no other fish outside of its family can do. If that isn’t fascinating enough, the grunting sound will continue unless the fish is released. How’s that for guilt-tripping? Most people recognize fish for two main traits: a) they swim, and b) they breathe through gills. 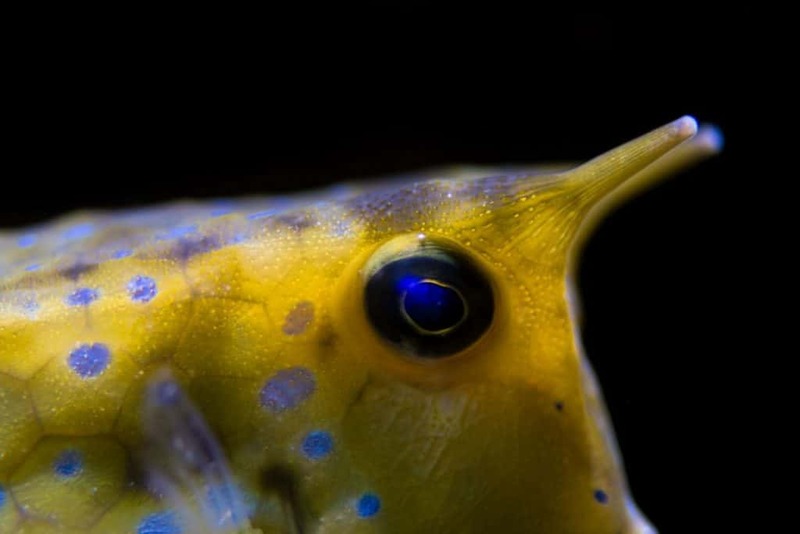 What makes the longhorn cowfish unique is that they don’t actually breathe through normal gills. Why is that? Simply put, they don’t have gills, at least not the ones that most other fish have. Unlike regular fish, longhorn cowfish only have slits or tiny holes located at the sides of their yellow spotted bodies. Technically, those are still called gills since they’re where the cowfish can breathe from, but since they don’t have a cover, they look nothing like regular gills. They still work the same way though, only without the covers. If you are interested in taking care of one, you do have to keep in mind several things. One, cowfish are peaceful fish, but they can be rather shy. Before getting one, make sure you choose the right tankmates for it. That means tankmates that will complement the cowfish and not terrorize it or annoy it. Try not to make the transfer hard for the cowfish, unless you want it to be stressed and kill everyone in the tank. And speaking of which, cowfish can cause a fish massacre when they’re stressed. Their skins excrete natural ichthyocide called ostracitoxin. This poison can kill not just themselves but also all other fish in the vicinity. Yikes! Third, give the cowfish ample space to breathe. Their shy and curious personality can cause them to break their horns rather often. And although they do grow back pretty fast, it’s pretty certain that you’ll still get worried Avoid that by putting them in a tank with the correct size and lots of space! The longhorn cowfish is a lovely and interesting fish that any aquarium enthusiast would love to have in their tanks. There are also a variety of longhorn cowfish facts, just like the ones we listed above, that are amazing all on their own. No wonder they’ve been gaining in popularity in the recent years! Lastly, longhorn cowfish are just amazing creatures of the ocean. If you’re ever going to get one, be sure to give it all the love and care you can give. Always keep it stress-free and happy in your tank. It may be hard to take care of, but it’s certainly worth it. Believe us, a fish as awesome as this only deserves the best in the world!